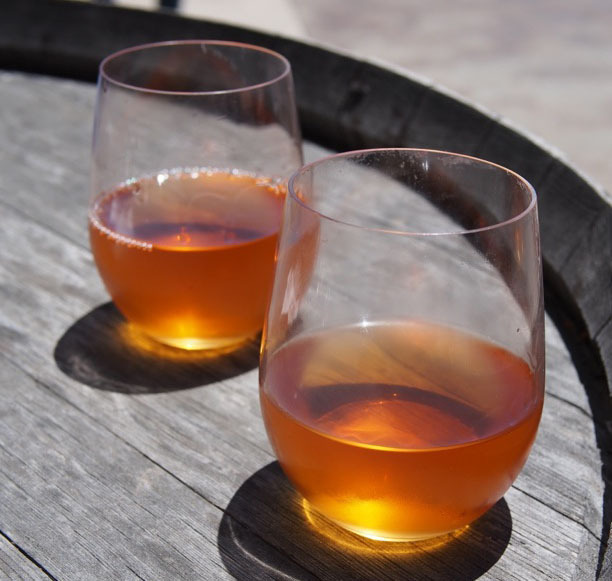 For the last few years, there has been a dramatic increase in the number of orange wines being produced in California, and the term “orange wine” is one that confuses people a great deal. People often think it’s wine made from oranges, others just dish out a blank stare when told they are drinking an “orange” wine. The truth is, orange wines have existed for as long as people have been making wine. So what exactly is orange wine? Simply defined, orange wine is made from white wine grapes fermented while in contact with their skins, much like a red wine, whereas traditional white wines are made by pressing the juice from the grape right after harvest, separating the juice from the skins and fermenting the clear juice by itself. Some “white” wine grapes have a little color to their skin, like Pinot Gris/Grigio, which can be any color from blue/gray to copper in color. During fermentation, orange wines extract color, tannin, phenols, and texture from the skins, just like a red wine (most red grapes have clear juice, red wine gets it’s color from the skin contact during fermentation as well). Here in California, orange wines are very trendy with modern winemakers. In Europe, orange wines have existed for ages, but there are a few mavericks making exceptional “modern” orange wines as well. Orange wines can be an acquired taste, as most people don’t expect a white wine to have tannins – the compound that leaves you with a “dry” feeling in your mouth – the same stuff that gives black tea it’s grippy texture. There aren’t a ton of orange wines on the market, in comparison to red, white, and rosé – but it’s safe to say that orange is the fourth color in the wine world. Like all wines, there are many styles of orange wines being made. Some see “extended maceration”, where the wine is left in contact with the skins well after primary fermentation is finished. These wines can be rich, tannic, viscous, and very akin to red wine. Some are only in contact with the skins until primary fermentation is finished (which can take 2 weeks or longer), and then pressed off the skins to new vessels to finish malolactic fermentation, or to age. Some producers of orange wine use huge clay amphorae to ferment and age their wines, which can produce wines with a slightly oxidative character and mineral component. However the wine is produced, one thing is consistent across orange wine production – the juice is left in contact with the skins during fermentation. You may also hear of orange wine being referred to as “skin-fermented white wine”. This is my preferred term for this type of wine, because not all orange wines are actually orange in color. Some may be yellow, golden, copper, or even slightly pink. However, not all white wine grapes have tinted skin. A great example of a white wine that is skin fermented and not totally orange is the Dirty & Rowdy Skin & Concrete Egg Fermented Sémillon. 75% of the juice is fermented on the skins, while 25% of it is pressed directly after harvest and fermented in concrete egg (another type of fermentation/aging vessel). The wine itself is not actually orange, though it does have a slight golden hue due to the golden skin of the grapes. This is why I prefer the term “skin-fermented white” – it’s a bit more politically correct. Orange/Skin-Fermented White wines are the ultimate food wine. They tend to have lots of acidity and pair well with a variety of dishes. I especially enjoy them with seafood, as they often have a slight brininess or salinity to them, which is an excellent match to salty, briny seafood. 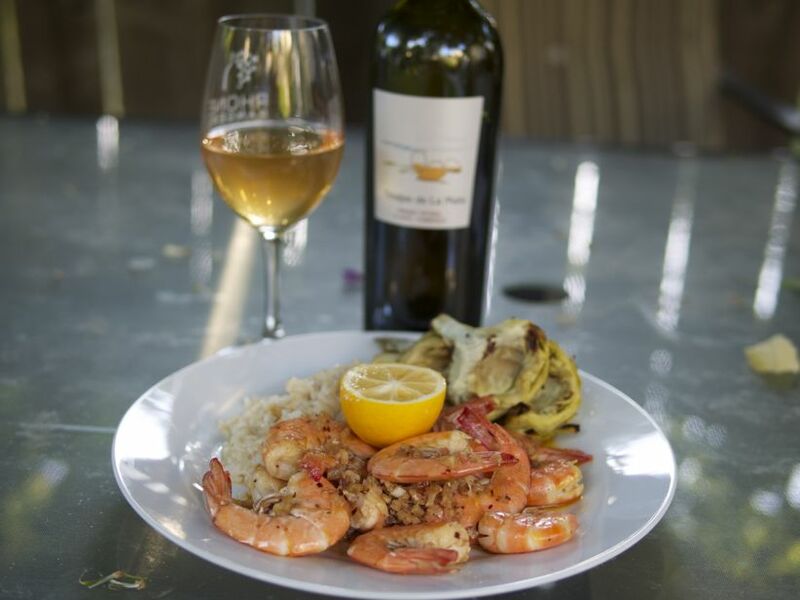 They are also great with cheeses, grilled vegetables, rice dishes, and grilled poultry. Here at Winelandia, we enjoy orange wine so much, we have quite a few of them for sale in our online shop. Orange wines are best served with a slight chill, so order some today to enjoy this week during our epic heat wave! A bright, fresh, mineral-and-herb driven skin-fermented white wine from an organic vineyard in Napa Valley. A deep and intense orange wine from the benchmark orange wine producer in Friuli. 2 weeks of skin contact gives this muscular and complex orange wine it’s beautiful copper hue and structure. A beautiful Cali orange wine made from a very rare grape grown in the Russian River Valley. Two weeks of skin contact and a skilled hand make a gorgeous orange wine that’s full of summer fruit aromas and delicate texture. Made from the highly floral and aromatic Muscat grape, this skin-fermented and amphora aged orange wine is intensely perfumed, electric on the palate, and beautifully structured. A gorgeous wine made from moscatel & merseguera, it’s delicately structured with a cider-like bouquet and plenty of fresh acidity. A great wine for a person who enjoys tea.